In this review, we flip, twist, and tabletop our way through the stunt racing game Uniracers. This game was released in 1994. While this game promised to be quite an interesting series, Pixar sued all chances of that into oblivion because Pixar had a short film that featured a unicycle. There’s really no story behind that so far as the game was concerned. Any storyline was relegated to the instruction manual. Some people say that this was a response to the Sonic the Hedgehog games growing popularity at the time, but the genre’s are completely different. If you want a game similar to Sonic the Hedgehog, a stronger argument would be the Super Mario franchise it was mainly competing with. Sonic the Hedgehog was an adventure game with collectables. This is a racing game with stunts. The only similarities are the speed, though I can see why some people would think this with the “hedgehog mode” buried deep within the game. You can pick from a somewhat large handful of unicycles in the 1 player mode. 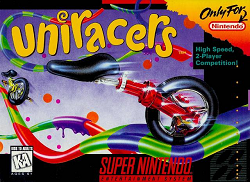 Contrary to what you might think, the only differences between the uniracers was the color. The different racers are merely save slots that have been jazzed up by different colors which are reflected in race by the small arrow icons, scores, and times. Once you’ve selected the color you want to race as, you are greeted by 4 tours. Each tour has 5 races in them. 2 of them are races where you race from a start line to a finish line (the arrow that points from left to right), 2 of them are lapped races (the circular arrow icon), and 1 of them is a stunt course. With exception to the stunt races, you square off wit another uniracer. At the beginning, you go up against Bronsen. While Bronsen is not much of a competition, you take the opportunity to get a handle of the courses while racing against him. If you defeat Bronsen in all 5 races in a particular tour, you win a bronze medal as well as the option to race for the silver medal. In the silver medal version, with exception to the stunt course, you race against Sylvia. Sylvia is a sort of advanced racer that does occasionally execute stunts mid-race. If you win all 5 races in Silver mode, you win the silver medal as well as the opportunity to go for gold. In the races in gold mode, you go up against the expert uniracer, Goldwyn. If you win all 5 races in the gold mode, you get treated to an often amusing short animation sequence where something bad happens to Goldwyn. Some of these include Goldwyn running over a landmine, getting attacked by your uniracer with a flamethrower, or even getting sucked up by a flying pink elephant. One nice little trick to utilize is, at the beginning, hold down the break and move the uniracer in the direction you want to go during the race countdown. If you release the break right to “go”, you’ll gain a nice small speed boost at the beginning which can be useful in getting an early lead. As mentioned, the stunt modes are the exception in where you don’t actually race against an opponent. Instead, you have a timer that constantly counts down. If the timer reaches zero, then the race is over. The goal is to execute as many stunts as possible within that time. If you meet or exceed the target score, you win the race. As you would expect, the required score differs between medal difficulty. If you win bronze in all four initial tours, you unlock two more tours. If you win silver in all 6 tours, you’ll unlock an additional 2 tours. If you win gold in all 8 tours, you unlock a 9th tour with silver automatically awarded to you. In the 9th tour, you are challenged by the infamous anti-uni. While anti-uni is arguably the same difficulty as Goldwyn, what separates Anti-Uni from Goldwyn besides the color is the ability for the Anti-uni to mess with anything from your controls to the overall look of the race. This often happens when you are close to the anti-uni during the race and can be anywhere between disorienting to outright frustrating. Win the races in the 9th tour, and you win the game. One critical element in this game are the stunts you can perform. While required to win stunt races, they are crucial in regular races. For every stunt you manage to execute successfully, you get a small speed boost. The more impressive the trick, the bigger the speed boost. Quite commonly, you are simply executing rolls on a straightaway (a roll and a twist if you are crafty), but the jumps allow you to execute more impressive stunts. the stunts you are able to execute are rolls (a front flip), flips (back flips), Z-Flip (sideways flips), twists, and mega (Tabletop or head bounce, though head bounce is only really useful in stunt mode. No idea what x3 and x4 mega tricks are). Stunts in stunt mode are quite interesting because there is actually a points structure not only for trick complexity, but also how often you execute a stunt in a race. The complexity of the trick simply follows something like a flip, double flip, triple flip, and flip city. A single flip city in stunt mode is obviously worth more than a single flip, but takes more air time to successfully execute. If you execute a single flip city, you’ll get the maximum points for that stunt in the race. If, however, you perform a second flip city, it’ll be worth less points. Any flip city after the third will net you the same small amount. So, in other words, you get more points if you execute a large variety of tricks as opposed to the same one over and over again. Another critical aspect of the game is the colors of the track. While I do deduct points for a lack of predictability in fast paced games, this game manages to skirt around this limitation by using the track colors to warn you ahead of time what is coming up next. Blue and green means that the track is either flat or won’t be changing anytime soon (such as on uphills), blue and reddish purple means that there are hills ahead, so stunts may be ill-advised. The purple with thin reddish stripes means there is a half or full loop ahead. A track that goes from yellow and blue to thin yellow and blue strips down to solid yellow means there is a gap ahead in the track (be prepared to jump). Yellow and orange means that you have gone out of bounds (often missing a jump and you need to get back on course). Thin yellow and orange strips means there is mud/goo ahead (be prepared to jump). Purple and blue up arrows with orange and yellow arrows overhead means that there is a section of rotating track that is both horizontal and vertical ahead (later tracks). Simple yellow and blue means that you are getting close to the finish line. The checkered strip means the finish line is extremely close. There are other small pieces of randomly colored tracks, but they typically appear after the finish line or in the middle of one of the bowl stunt tracks. They don’t really mean anything and often play a role little more than simply sprucing up the color scheme in a subtle way. In addition to this are small elements within the tracks. The two goal posts are, naturally, either start/finish lines or checkpoints. Checkpoints allow you to find out how far ahead or behind your opponent is. There are also arrow track sections that force your uniracer into a particular direction (up, left or right). There are three color schemes on these sections of tracks. The most common are the blue and flashing arrows which means it’s just a straightaway ahead. The orange version means that a hazard is ahead at the end of the strip. The final ones are yellow which means the finish line is close to the end of the strip (only remember seeing this once). There are also hazards on the track. This includes the aforementioned mud/goo which slows your uniracer down. There is also ice patches which doesn’t permit you to quickly go from one direction to the next (rare). Track rotating sections will flip your uniracer up and down or left and right in relation to the track in a controlled manner. If you jump and land on top of these sections, you’ll be sent back to the beginning so you can rotate down properly. The final hazard I can recall is simply track configuration. Sometimes, you may encounter walls which either force you to change direction or force you to press and hold a button so you can jump over it. These are often the most frustrating because if you don’t actually get climbing over these obstacles right the first time, you end up losing a lot of time – and sometimes the race. So, quickly overcoming these obstacles are critical – especially in the later difficulties. One final note were the messages and arrows that can appear in the race. If you see an arrow, it means your opponent is ahead and it points in the direction you need to go (even up or down, but that’s exceptionally rare). Two arrows mean you are more than a couple seconds behind. Three arrows means you are very far behind and may need a small miracle to catch up. The messages that sometimes appear on screen following particularly complex stunts can be both fun and mildly funny. The great part about this game was the coloring scheme which takes a large amount of guesswork out of the game and puts the difficulty back into skill and reasonable reflex. Sometimes, the track will throw some curve balls at you, but that adds more of a challenge to the game more than anything else. Memory work is somewhat minimal here, but memory work can help you perfect those times and scores. Another great part about the game is the difficulty curve. The bronze races allow new players to get used to the tracks and controls while the gold races will definitely challenge you. This game does have the difficulty set about right. The game is also quite addicting. There’s always something new to earn. When you’re not earning something new, you are narrowing your times down to finally beat your opponent. Even if you managed to perfect your game to the point where the in-game opponents no longer represent much of a challenge, there’s always the high scores to improve on. So, lots and lots of replay value abound in this game. My only real complaint about this game is that if you win a few races in a tour, then load up a different player, you lose those victories and are forced to start over. This puts emphasis on completing tours before you turn the power off. This was a minor quibble of mine, though. Some people complained about the graphics and I honestly don’t know why. The background was nicely animated, but also doesn’t detract from useability. If it was any more colorful or flashy, it might be hard to see some of the arrows (which changes colors depending on your uniracer color). Still, the flashiness gives a nice amount of life to the game. I also thought the font choice was decent enough in the menu as it broke away from the standard fonts used in NES games which are sometimes carried over to the SNES. The backgrounds in the races were decent enough. It’s meant to be abstract and the abstract nature actually gives this game a breath of fresh air over numerous other games that use castles, bricks, forests, deserts, stars, and a small host of other earthly art. It didn’t take too much away from the action in the foreground, but added a nice bit of splash so the races don’t seem dull. I also really liked the neon level because if had a cool glow to everything in the black. If your racer left the course in the midst of a stunt, the glow effect faded to a dark reddish color. I thought that was an excellent change of scenery. The sprites and the art range anywhere between decent to adding a nice subtle sense of character to the game. The uniracers certainly had a nice amount of life added to them. In race, the seats can look at each other when they are close. At the end of the race, there is a small handful of different things the uniracers can do to either celebrate a win or get disappointed in a loss. I thought that was a great added touch to the overall game. 3D games did start appearing at around this time when this game was released, but I thought this game held up very nicely on its own. The colored tracks was an exceptionally good idea. Some complained about the sound effects, but I didn’t think there was anything wrong with them. I thought they were both different and functional (with respect to the stunts). You don’t have to look at the messages to determine what you were successful in pulling off (or not with that cursed wipeout sound) and, instead, focus more on racing if need be. The music really made this game though. The energetic rock in this game really stands out and works exceptionally well in this game. Maximum points for the music. Overall, this is definitely a favorite game for many who have had the privilege of playing and it’s easy to see why. The difficulty is both challenging and approachable. The races are both fast paced, yet somewhat predictable. The stunt elements thrown in help make this game unique. The graphics are quite good and the sound quality is superb right down to the anti-uni’s laugh. The small easter eggs in this game are interesting, the animations are great, and this game is both fun and addictive. Definitely a highly memorable and excellent game to play. Furthest point in game: Defeated anti-uni with all the uniracers in the game, but only did this once. Nothing special happens sadly.